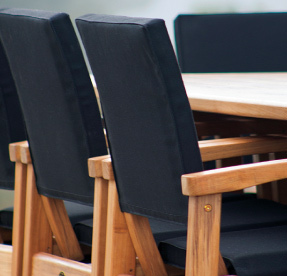 What is it that makes Devon Outdoor Furniture stand out from the rest? We think the innovation and design speaks for itself. Behind that you'll find the best raw materials, sourced from around the world, leading edge construction techniques that cut no corners, and the most important of all – a passion for outdoor living we bring to every piece of furniture made. We believe the value of a Devon table doesn't rest on the table top. As with most things, it's what's going on underneath that counts, and for all Devon Furniture this includes construction that copes with the stresses of weight and movement admirably. Joints are designed to flex with the timber movement, and extreme weather conditions won't contort the furniture thanks to quality materials and precision design. Some outdoor furniture suffers because of inferior fittings unable to withstand outdoor exposure, and in particular, salty coastline conditions. Not so with Devon furniture – all our fittings are made from quality stainless steel, aluminium and zinc alloy to prevent rust. Their natural finish will keep shining through rain, shine, salt and water spray. Devon’s teak furniture is finished by fine sanding and/or brushing. We then buff the surface of the teak to draw out the naturally occurring teak extractives. A coat of Devon Timber Furniture Shield is applied to repel water and dirt and protect. If your furniture is inside, the natural honey colour of the teak will slowly darken, while your outdoor teak furniture will fade to a silver-grey patina. To maintain the natural honey colour of the teak use Devon Furniture Care products. Devon woven furniture uses synthetic weave, tightly woven by hand to achieve exceptional comfort and appearance. Synthetic weaves are high-performance outdoor materials – UV and fade resistant, and able to withstand extreme temperatures and harsh weather conditions. Our synthetic weaves are made from polyethylene, which can be recycled completely residue-free. You can clean your Devon furniture’s weave simply by using a soft brush, and a mild soap and clean water solution. Don’t use any type of abrasive agent or scouring pad, as scratches can remain on the surface. All Devon fabrics are woven from weather resistant, highly durable acrylic fibres to create a colourfast fabric that won’t fade, crack or tear. And you’ll find they stay cool even in the hot sun. Our fabrics are sourced in the USA and Europe, where they’re used extensively for awnings and for marine applications such as boat cushions – they were made to withstand the elements. We were the first to combine these fabrics with wood to create outdoor furniture, and we’re so glad we did. Our chair covers have been known to last upwards of fifteen years outside but on average you can expect between 7 and 10 years before re-covering is recommended. Devon fabric is made from acrylic fibres that resist the growth of mould, unless dirt is left on the fabric for extended periods of time. We recommend regular cleaning to prevent this, with a mild soap and lukewarm water solution.